I am dedicating this Ruby Tuesday post to Pia K.
She has two wonderful blogs that have some lovely flower photos in them that she has taken walking around the Sweden country side. A couple of months ago I told her that I had a longing in my soul to see some Jack-in-the pulpit flowers. Where I used to work in the country side, I would, every spring have a whole garden of them to enjoy. Well Pia K told me that she has never come across one in her travels, so I thought that I would take a few from my picture file of 2007 and put them in here just especially for her. After all haven't I been feasting my eyes on her pictures since I joined Ruby Tuesday? I feel that I owe her at least this! 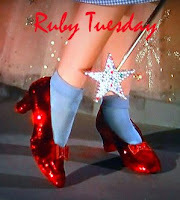 Mary T, my dear Teach, I have managed a little ruby in this Ruby Tuesday post to add to your red dancing shoes. aren't you a woman of many trades? Never heard or seen Jack-in-the-pulpit before. Your eminent close up shows me jack standing preaching from the pulpit. I've never seen its like, probably neither will. What I love the most about the Ruby Tuesdays is getting my horizon broadened. All the wonderful people with all their variation of displays. Pia K sure deserves your praise. She's got the eye for the unique. They are just like little preachers, eh?. Their leaves look like they are waving their arms as they are telling the good news! I have always loved Jack-in-the-pulpits. When the four oldest Golden children were little, they used to love to scour the forest looking for these wee men, but I am telling you, they were few and far between. Whenever Betty, Terry. Teddy and Gary DID see one, they would ever so gently look at them and admire them and then leave them alone. It didn't even enter thier minds to pick one. Oh the agony of it if they had of! When I worked looking after an elderly lady in her country cottage and saw all those beautiful Jack-in-the-pulpits, I could hardly believe my eyes! Yes that Pia K deserves a lot of praise! I too have never seen these flowers.So slender,fragile and elegant. Wonder why they are named so? I am going to have to look for this precious plant...I want some for my own back yard. 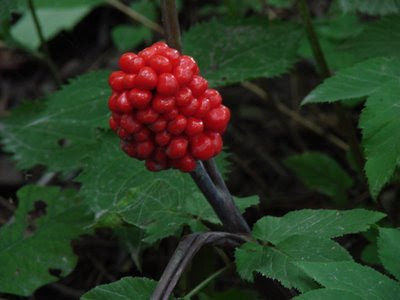 What a sweet post, Terry, thanks:) Jack-in-the-pulpit looks lovely, reminds me of lilies of the valley (which we do have a plethora of here), those red berries are very fetching too. Jesus..... What A Lovely Name!